Flood danger alert for drivers | What Car? 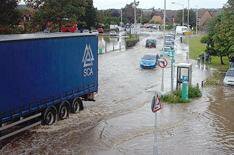 Drivers face the hazard of flash floods as the UK's heatwave breaks, according to the Institute of Advanced Motorists (IAM). Torrential rain and floods could hit motorists throughout the country as thunderstorms threaten havoc on the UK's roads. Increased braking distances, treacherous road surfaces and poor visibility are all likely as the rain falls. 1) Drive in the highest section of the road and don't attempt to navigate the flood if a vehicle is travelling towards you. 2) Leave time and space between vehicles in floods, so you don't swamp other vehicles with your wake. 3) Don't take your foot off the accelerator while in deep water, as this could allow water to travel up the exhaust pipe and stall the engine. 4) Drive slowly and keep going once you have started. Make sure you have a clear run and keep the revs high by slipping the clutch (which means keeping the clutch pedal just slightly depressed, so the clutch isn't fully engaged) while you are in the water. 5) Once you're out of the water, dry the brakes before you need them - the best way is to lightly apply the brake as you drive along for a few seconds, checking nothing is following you too closely. 6) Don't forget to close your windows. The Met Office has issued a severe weather warning for heavy rain across the UK from Strathclyde to Suffolk throughout Friday.